It was December 2010 that I spotted my first 106 in the wild, since then I have added another 219. 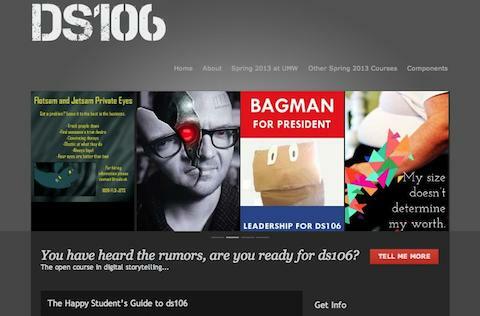 Tomorrow is the deadline for final projects from my Spring 2013 UMW ds106 students. A few grades punched in the system later, and I close out my current era of teaching ds106. After being part of the 2011 horde of open participants, I taught it in person at UMW in Spring 2012 (a parallel section with Jim Groom), co-taught with Martha Burtis the online summer 2012 “Camp Magic Macguffin” experience, and taught a parallel online section with Martha in Fall 2012, and this current semester was the solo teacher at UMW. It’s been quite a ride, but I’m hopping off the bus. Jim is lined up to teach a 5 week summer session starting in May; it should of course be over the top, but you will need to check with him for details. I’ll be around, but not as a teacher. It’s time to do something different (that is TBD). I was talking with Martha last week about another topic, but like usual, ds106 came up. It looks like no one will be teaching it at UMW in the Fall (as far as I know), so it will be interesting to see where the community flows. The level of activity among open participants fell off a lot since the first buzz year in 2011. It’s not surprising, I would likely more my attention elsewhere after an intense following of ds106. And while there is a lot of things in the ds106 universe, on first entry as someone who maybe just signs up, there’s not a whole lot of direction or a road map. I tried to outline some routes in the Quick Start Guide. I had dreams of building a part of the site that would be a kind of “build your own syllabus”. Between the Assignment Bank, Daily Creates, and the 2+ years of lessons we have assembled for our UMW class, we have a rather large pile if resources. What if there was some way to identify and interest area or level, and them pick and choose resources to make a syllabus for yourself or others? I had the idea, but not the time to make it happen. Coming off a mini ds106 immersion workshop last week for faculty at Wagner College, and in talking with Martha, it seems there is room for perhaps some other “sizes” of doing ds106- maybe a faculty development series, or maybe a month focussed on doing say design or audio (which is what it sounds like Scottlo is cooking up). So while I am done teaching ds106 at UMW, I am at the peak of my game (maybe), so if someone, somewhere else is interested in running it as a course, workshop, interpretive dance, give me a bark. and I have a few storify collections to assemble as I review the current students work- their final projects, student’s identified “Best Works”, and one of my favorite, the advice to future ds106ers (again these will fill out as I grade slug tomorrow). I cannot say for sure what will happen with the Daily Create – I will likely fill it up for at least May and June. There might be some rethinking that needs to be done there since YouTube has pretty much killed the functionality of tags (so we cannot retrieve videos by tags), and SoundCloud is still stingy on letting accounts create but a single group. It might be time to figure out a way to parse out the submissions from twitter and tags, like the old DailyShoot used to do. There’s likely a boat load of my more post game reflections. This class by far had some of the best creativity and blog writing of any class I’ve had before. It says a lot about UMW and an environment where web publishing is kind of a regular thing. I look forward to seeing how these students put their #4life skills to work (and play). But after next week, someone needs to shut the porch light off for ds106. UPDATE: I looked at my computer clock right as the post was publishing. It has a 106 in it! 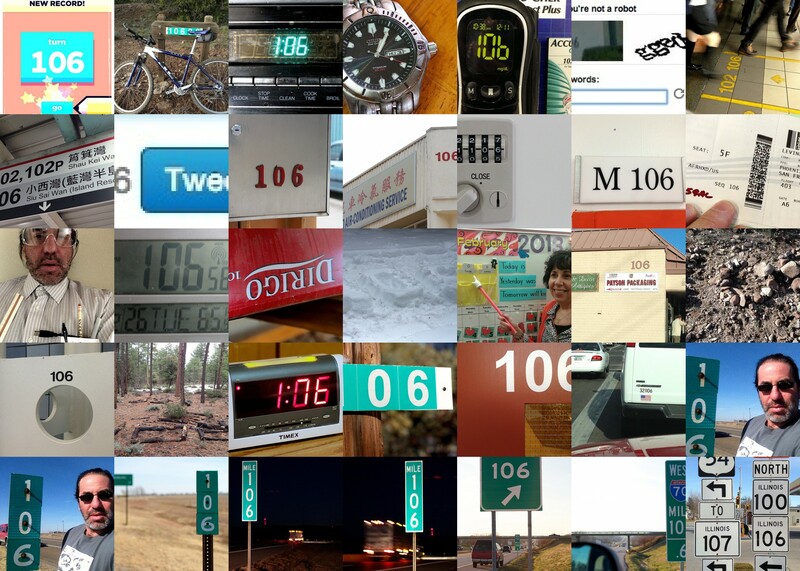 MORE UPDATE: And now someone steps in with a new summer 2013 project that plans to use ds106! I will add them to the registration system ASAP. Well the good news is the system is tuned to the point now where it’s possible to run it as an account on Hippie Hosting and that’s exactly what we’ve been doing, so there won’t be a need for Kickstarters and dedicated servers going forward (unless we suddenly get a massive influx of activity on Stanford AI Class levels or something). So the future of the site and service is secure. Regarding TDC I really wish they had open-sourced their code when the Daily Shoot closed their doors. It would have been so helpful. We could focus more on the photo stuff which is easier to aggregate. I am interested of course in things like Vine that make editing a 6 second video easy and since those end up on Twitter they could be a way to pull those in via hashtag (though I’m not sure that Vine has much in the way of an API or feeds or anything, haven’t explored it much). I do feel your pain in knowing that you’ve done an outstanding job of making sure everything is scheduled and gets posted for the past year and a half with that space. In Japan, you say otsukaresamadeshita, thanks for all of your hard work, thanks for tiring yourself out (on all of our account(s?)). I hope you enjoy having a bit of a break now, and if you’re ever in southeastern Michigan, stop on by, we’ll tie one on. I’ve just now started going through your amazing ds106show series. I’m staggered by the thoughtful conversations you share with the students. This is an awesome model for running a class! Seems a shame to step away when you are running at full stride with ds106. But I’m sure you’ve got even more amazing and inspiring work to do. Is it true that there’s no one penciled in to teach ds106 next September? Maybe they should consider jetting in the Lo. Thanks Scott. I’m feeling top of my game for teaching ds106 but also an urge to do something new. True, no on is slated to teach ds106 at UMW next fall; the only option for students there might be the dude that lectures from a textbook. You should check with Chairman Groom about the status for off shore teachers. That would rock to have you take the reins. As you know, Alan, I have just recently really “found” ds106, and started getting quite excited about the whole thing, including the open, flexible structure. And I had dreams of doing enough daily creates to actually get good at them. To hear that maybe someone needs to turn off the porch light makes me very sad, indeed. I feel like I missed the boat. Maybe I’ll take the summer course as an open participant, though I really don’t have time at the moment. Are you saying there may be no more daily creates after June? or am I misunderstanding that? Maybe someone could commit to ensuring there is at least a weekly create? Of course, I realize that in bemoaning all this the logical response is: why don’t you do it, Christina? Well, maybe if I take the summer course I can. Otherwise I’m pretty much just a beginner who has knocked on the door a couple of times. I’m not saying that Daily Creates will stop. I enjoy running them and might just keep them going or pump them through the end of the year again, and if I lapss, I am sure someone at UMW will keep the light on. I was trying to suggest that maybe the open community can start making suggestions how to sustain it in a form that works for people like yourself.